Welcome to something new. From now on Seppin and occasionally Rek will be reviewing the comics that appear each week. Each book that they review will get it’s own post and will have it’s own score to the book. So, Spider-Geddon is going to basically be SpiderVerse 2.0. Which is why it is going to be totally awesome for most Spider-fans and also why it is going to be yet another complicated event for all readers. Marvel is starting their new event off similar to Edge of the SpiderVerse with Edge of Spider-Geddon. Logically this is a smart move because it allows fans to get a better relationship with new players and important characters. 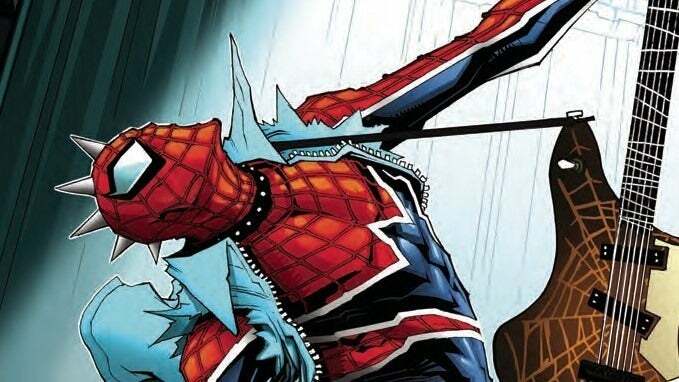 However, when I found out that they were going to start off with Spider-Punk, who is a relatively background Spider-Man. I thought it was just to sell pre-orders for Spider-Man PS4. After reading the issue, I know that was the main reason and I love it. They didn’t beat around the bush. The whole story is about Spider-Punk’s name and how much they can sell his merchandise for in the future. Overall it is a fun story that isn’t afraid to be too Meta. New Civil War Trailer Initial Reaction: Spider-Man Debut.